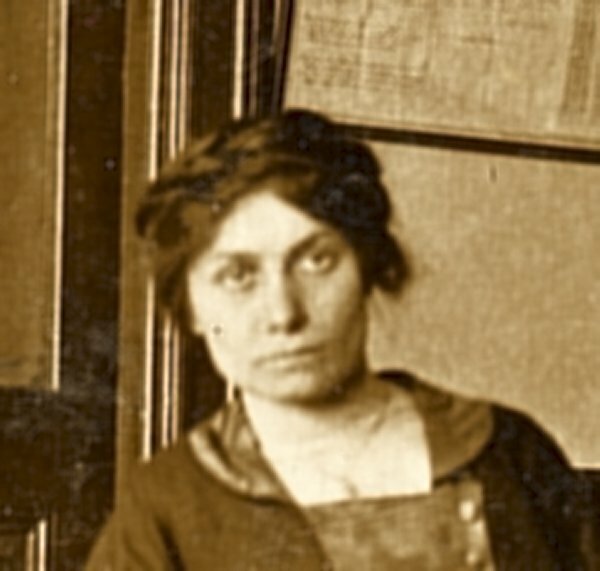 Enlarged detail of postcard above. 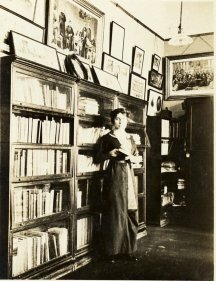 I came across three real photo postcards (2 shown above) showing an unknown woman in a library/study/office/museum? I thought she might be someone of note. The framed print abover her head on the first postcard depicts the first reading of the Emancipation Proclamation by Lincoln before the cabinet. Any ideas about her identity? The American Library Journal (later the Library Journal), the first professional library magazine, began publication in 1876. It was one of several major library history events that occurred in that year including the establishment of the American Library Association. 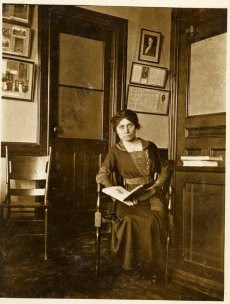 Three individuals played prominent roles in the establishment of both the Library Journal and the American Library Association. They were: Fredrick Leypoldt, editor and publisher of the periodical Publisher's Weekly; Richard Rodgers Bowker, Leypoldt's partner and later publisher of the Library Journal; and Melvil Dewey, the first editor of the Library Journal. The Library Journal served as "The Official Organ of the Library Associations of America and the United Kingdom". It was not until 1907 that the American Library Association began publishing its own journal, the ALA Bulletin (now American Libraries). 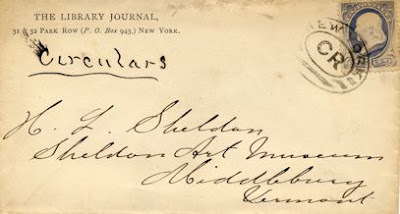 I recently acquired an early envelope mailed by the Library Journal (shown above). Based on the return address and the stamp on the envelope, it was mailed in the 1880s. The envelope included material classified as a circular which qualified it for the one cent postage rate. Because I use envelopes and other postal artifacts to tell the story of America's libraries in my philatelic exhibits, its nice to have this envelope with connections to the early history of one of the most prominent professional library periodicals and the American Library Association. 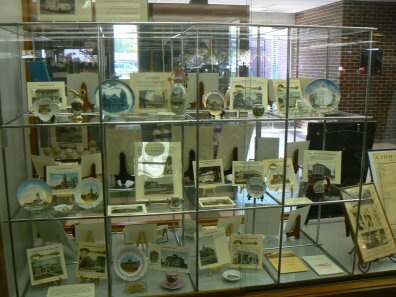 I have a large collection of Wisconsin library memorabilia that I exhibit under the auspices of the Wisconsin Library Heritage Center. 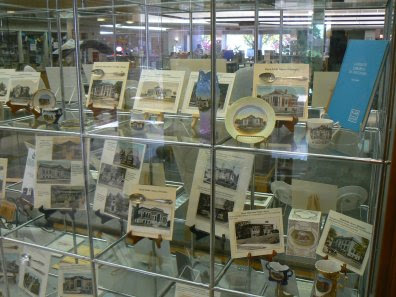 The exhibit is currently on display at the Kimberly branch of the Kimberly - Little Chute Public Library. 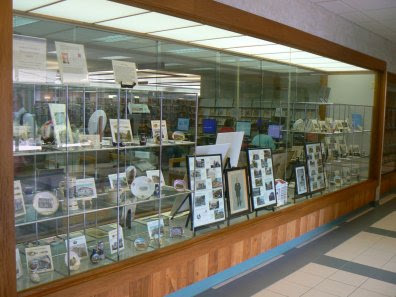 The exhibit will be at the Kimberly library through the end of December and a smaller exhibit will be at the Little Chute branch in January and February of 2013. Because of the unusually large display area at the Kimberly library, the exhibit is one of the largest that I have put together. I've really been able to clean out my basement for this one. Some images of the exhibit at Kimberly are shown above. Just over four years ago I made the decision to start a blog about library history. At the time I didn't know if I would be able to come up with enough content to sustain a library history blog, but a topic for a blog post always seems to present itself. So far I've managed to come up with 529 posts. I'm especially grateful for the coverage that has been given to the posts by American Libraries Direct. That coverage has helped generate over 186,000 pageviews during the four year life of the blog. I'm amazed that there are 192 people who have actually taken the step of becoming an official "Follower" of the blog. Thank you to those individuals, and thank you to all the others who have taken time to read the blog. The Central Library of the St. Louis Public Library has been undergoing a $70 million restoration and modernization and is set to reopen in December. Today marks a special occasion in the fundraising campaign for the project. The library will hold a sold-out "Central to Your World" gala at which Vartan Gregorian, current president of the Carnegie Corporation of New York, will speak on "Public Libraries in the 21st century". The Central Library was built with funding from Andrew Carnegie and opened on January 6, 1912. 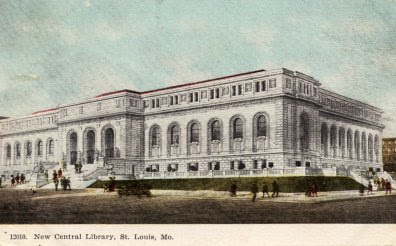 The St. Louis Public Library has set up a website that includes information about the history of the Central Library and the current renovation. The postcard shown above which features a drawing of the proposed new library was mailed on September 17, 1909, more than two years before it opened.